I'll admit, when I moved to Chapel Hill, NC from LA last year, I was pretty despondent about leaving LA's amazing carscape. I'm delighted to say that I was more pessimistic than I needed to be. This was proven conclusively when I passed a house, not five minutes from my own, that was infested with Citroëns. Seeing this place was just what I needed. Of course, when I see a place with interesting cars, I'm pretty much legally required to find out who owns the cars and talk to them, rewarding their bold car choices with what could easily be the most unpleasant three minutes of their lives. Happily, like most people with interesting taste in cars, the owners proved to be engaging, pleasant, and very willing to talk about their Citroën fleet. The owners were Renate and Til Stürmer, who, along with their young son Leo, live with a whole stable of Citroëns: two 2CVs (1981 and 1976), a '72 DS21 Break, a '67 DS sedan, an '87 CX (likely to become a LeMons car), and a '71 SM. That's amazing. What's more amazing is that one of the 2CVs and the DS Break are their regular-use, daily drivers — these guys eat their own escargot, as it were. I'm just going to reiterate this because I think it's so fantastic. In an era where so many moms are paranoid about putting their kids into anything other than an airbag-gorged light tank, Renate is putting Leo into a car seat in the back of that 2CV and taking him to school or wherever. And as a result Leo is going to be one of the coolest kids in his class, no contest. He, of course, loves it. Til's family got a 2CV to replace their Fiat 600 when Til was growing up in Germany, and his love for the Tin Snails started there. His father was always "thrilled by the complexity" of the Citroën DS, but "never dared" buy one himself. His mother drove that 2CV for years and years, and eventually it was passed down to Til, who's keeping it in remarkably good condition. When I visited, Til had just refurbished the '81 2CV's gas tank, and when he showed it to me the strangeness of the 2CV really hit home. It looked like he was holding a watering can. And that's sort of how the 2CV fundamentally is: a collection of parts that are each designed to be the most basic, simple, efficient way to get the job done, even if the result is absurd looking. The DSes are a very different story. It's really sort of crazy to think about the Citroën of this era, making simultaneously one of the most complex and sophisticated cars of the time right alongside one of the crudest, simplest cars, and with almost nothing in between. That's what I love about the company — they were literally all about the extremes. It was a grey sort of day when I visited, with a light rain drooling down like God fell asleep with His retainer in His mouth. That meant that the pristine '67 DS sedan would wait until a nicer day, but Til was more than happy to let me behind the wheel of the US-spec '72 DS21 Break. Break is what the French call a wagon, and I was what the French call a "delighted idiot." Before I get to the full review, let's just try to put the DS into context, a bit. When it came out in 1955, it was so far ahead of anything else around that if the French claimed they captured a UFO during the end days of WWII and the DS was the result of what they'd learned, nobody would have given it a second thought. "Ah, okay," we'd say. "I get it now." It was like they put away everything people knew about cars and just started with a clean page. 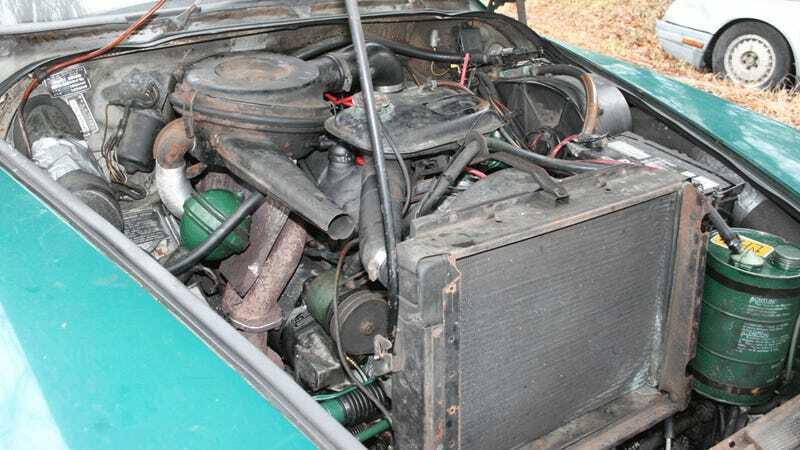 Well, except for the old, holdover 1911cc engine. But still, that barely mattered, because the DS is, even more than most cars, more than the sum of its parts. It didn't really matter that the first engine they used was sort of long in the tooth, because it was just one piece for that whole amazing hydraulic system and that incredible, advanced body, and that space-ship-cribbed interior. Maybe a Tesla is the closest analogue we have today? Anyway, let's really talk about this incredible, otherworldly, machine. The DS isn't everyone's cup of hydraulic fluid, but I personally love the cyborg-shark look of the car. I'm marking down this particular one a bit because, as a US-spec model, Uncle Stupid decided that the amazing glassed-over, directional headlights used in Europe were too good for us, so US DSes got a pair of plain-old round sealed beams. It's not terrible, but the Euro lights just look so much cooler. Also, for some reason the original indicators were deemed unworthy, so they got little ribbed covers and round ones slapped under the bumper. I'm not sure what we were thinking, either. The DS is one of those rare cases where I think the sedan looks better than the wagon. That's not to say I don't love the way a DS Break looks, because I do, but the original teardrop profile of the original DS is just too hard to beat. The Break looks a bit oddly long in profile and just a bit happily awkward, mostly thanks to a low nosenose/tall greenhouse ratio we don't really see anymore. Even so, the overall design is so staggeringly useful I can't mind it much at all. They all came in two-tone, which I think works really well here, and overall I find the car sleek and futuristic in that future-that-never-quite-was sort of way. I love the canoe-full-of-pool balls taillights and that fantastic clamshell tailgate/hatch. The tailgate is worth its own mention here. When it opens, it doesn't take up much space behind the car, and it gives incredible access to the interior. The lower gate can be used to extend the loading area, and there's even a hinge on the license plate so when you drive with it down, your plate can remain visible and everything stays nice and legal. I love the look of the DS, and even with my caveats about the wagon compared to the sedan, I think this is a fantastic, striking looking car. Citroën really thought through about what would make a really, really useful wagon, and they were wildly successful in the interior. First, the cargo area is pretty huge for a wagon of this size, and it's got a totally flat loading floor. The rear seatback is metal, so it extends the load floor further when folded down. The front (split bench) and rear bench seats are, let's be honest here, couches. Or even sofas. They're overstuffed and you sink into them like a favorite armchair and they just don't feel like the sort of thing you're used to in a car. They're incredible. In addition to the front and rear seats, there's a pair of very usable jump seats in the cargo area, staggered and facing one another. They have much more legroom than you'd think, and fold away totally flat, thanks to the spare tire living in the nose in front of the engine. This car could seat eight with ease. My one complaint is that Citroën, like seemingly every car designer in the 1970s, decided to let the guy who designed Hi-Fi sets and clock radios for Sears take over the interior design of all their cars. Where a DS's dash was once this grand, space-age study in interesting materials and mid-century simplicity and elegance, now we see those same novel, carefully thought-out forms, but covered in black textured rubber and plastic, always in danger of being slapped with substantial acres of fake woodgrain. Everyone in the 70s fell into this trap, but I'd kind of hoped Citroën would have risen above. Sadly, that's not the case. Even so, there's still a certain charm to it all, and the whole thing just functions so damn well, I'm still giving it an 8. This DS has an engine that's more worthy of the car than the original 1911cc Traction Avant holdover, the 2175cc four. This one I believe is the fuel-injected one, which made about 137 HP and about 130-140 lb-ft of torque. The carbureted version of the engine is only making about 109 HP, though. For the era especially, the power's not too bad, and the car isn't ponderous or slow. Of course, it's not particularly fast, either, making 0-60 in around 12 seconds or so. That barely matters, though. Driving a DS is so different-feeling from a conventional car that you don't even judge if it's fast or slow — it keeps up, it gets you to the speed you need, and it works. Where many cars are defined by their engines, I felt like for the DS the engine is just the prime mover of a much larger surrounding system — the car's real mechanical character comes from it's all-encompassing hydropneumatic system, and I suspect you could swap in almost any other similar four-banger and not lose a crumb of this car's character. Like almost everything on the DS, the brake system was way ahead of its time, advanced, and strangely idiosyncratic. The first thing you notice, of course, is that unlike, say, every other car you've ever driven, ever, there isn't a brake pedal. Instead, there's this funny little rubber mushroom/foot-button thing. To look at it, you'd think it'd just be like an on/off sort of switch, since it doesn't appear to have any travel. But you'd be wrong. Thanks to some of the blackest French magic, it's pressure sensitive, so the harder you mash that mushroom, the harder you stop. And what that mushroom is controlling is a set of the first front disc brakes ever used on a mass-production sedan. And even that's not enough — these discs are inboard, to reduce unsprung weight, and they have their own dedicated air ducts to cool them. The result is that the first time you use the brakes, you'll stop way too hard and short, because your feet have no idea what to do with that rubber button. But after a few tries, you'll figure it out, and you'll soon come to respect these powerful and very controllable brakes. I once I got used to it, I found them quite intuitive and very effective. One detail about the brake system: it uses the same green hydraulic fluid (a green-dyed mineral oil called LHM) as the whole hydropneumatic suspension system of the car, and that green fluid is really the green blood of the DS, flowing through pretty much everything, like a Vulcan. I wouldn't be shocked to find that the radio used it for volume control or something. Prior to the green fluid, which is non-corrosive, the DSes used regular red brake fluid, which had the nasty side effect of eating away at the rubber hoses and seals. The green fluid is much, much better, but it took Citroën years to convince the US to let them use it as brake fluid, too, since it isn't you know, technically brake fluid. That delayed adoption in the US until '69 or so. The emergency/parking brake is well-designed, too, and at rest sits in a position just like a brake pedal, ready for a panicked foot if needed. This is really the part where the DS truly shines. So much has been written about the magic carpet-like ride of the DS that you'd think there'd be no point in spilling more ink or pixels on the subject, but then you get a chance to drive one for yourself and you're just as bad as anybody. Which I am, too, because I want to tell you how remarkable riding or driving in a DS feels. I can't really make any magic carpet comparisons, because the only magic carpet I have experience with was an old college roommates's rug that was so saturated in booze and various drugs that rolling around on it would give you a pretty reasonable high. But I am familiar with that old standard of luxuriant automotive ride comfort, huge American 70s and 80s cars like Cadillacs and Lincolns, and I can say the DS soundly beats them at their own soft comfort game. Where a softly-sprung 70s Caddy feels like riding a couch over a massive wad of marshmallow fluff, wallowy and with a sort of oceanic motion, the Citroën feels more like some kind of hovercraft. The suspension isn't so much soft as it is laser-focused on the goal of dealing with all the imperfections of the world so you don't have to know they exist. The car doesn't wallow — it glides, it floats, it stays level and composed even if you're driving over a road made of railroad ties and concrete-covered rhino carcasses. You can sort of hear and feel it working, distantly, but the end result is the body of the car stays level no matter what. It's amazing. It feels robotic, almost, in the way it reacts, on its own, to its surroundings. This car is over 40 years old and yet manages to feel more advanced in some ways than cars being built today. Based on the soft ride, you'd think there'd be pretty significant handling compromises, especially if all you had to compare to were big old softly-sprung American RWD sedans. The DS is an entirely different beast. It's FWD, with a longitudinally-mounted engine behind the transmission, putting it in an essentially front-mid placement. The roof is fiberglass, among other efforts to keep the weight and center of gravity low. I only drove it around neighborhoods in Carrboro, NC, not on a track, but I can tell you it handles and feels more like a slightly understeering Japanese FWD car than anything close to its size and feel. There's a bit more body roll on occasion, but less than you'd suspect, and it stays controllable even at speed in sweeping curves, for example. The steering is precise and responsive, even if almost all the feel is filtered out through all that green hydraulic fluid. It never feels ponderous or floaty, and even if the ride is smooth and soft, the handling is puzzlingly crisp and taut. It's hard to actually make the ride feel and the competent handing fit together in your head, but there it is. First off, this was the first four-on-the-tree I've ever driven, and that alone was a pretty big treat. I've driven a column-shift three-speed before, but having that full H-pattern up there and sideways was pretty novel. And, it was less difficult to get used to than you'd think. The DS was originally conceived with the hope of an automatic transmission. And the truth is that this is one of the few cars I can think of where maybe an auto just may be the right choice for the character of the car. Til's lovely '67 DS sedan is an auto and on this car I see the appeal. It's all so power-assisted for everything else, why not have it shifting its own gears? That said, shifting on the tree in this big green frog was fun. The synchros were worn for first and sometimes second, so it took a bit of practice and double-clutching to get it right, but that's more a factor of age than the car itself. This DS Break feels like it can do absolutely everything you'd need. Have to transport an acapella group of six people and two kids to the airport to get them the hell out of your house? The DS can do that. Have to get a whole bunch of 2x4s and bags of cement from Home Depot? Fold the seat down and drop that tailgate, and the DS can do that, too, and even make sure you stay nice and level in the process. Need to do some light off-roading? Crank that lever to the top and get six full inches of ground clearance. Need to take a long highway trip in extreme comfort? Done? Want to do all this and still get about 25 MPG? No problem. Even if you took away the striking looks and all the strange little quirks, it'd still be simply a really practical car. The unusual technology the car's packed with isn't just to be weird, it's to make life easier. Have a flat? The DS can jack itself up with its hydropneumatic suspension. 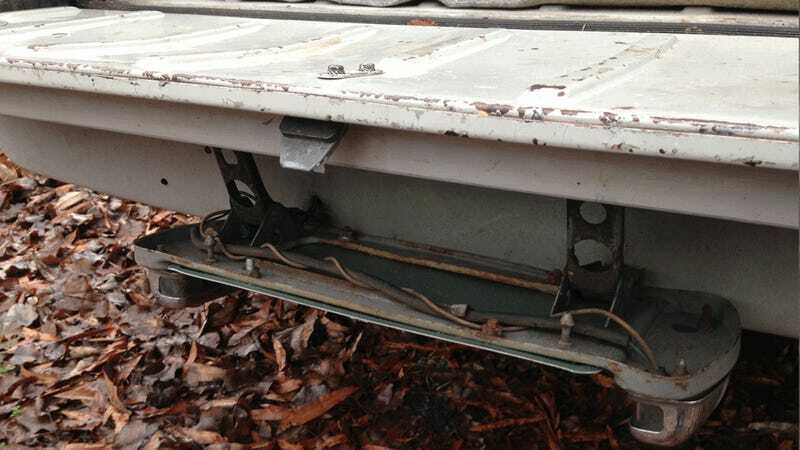 There's no jack — just a stand to stick under the car after it does the hard work of jacking itself up. And, it can even drive with just three wheels, as we've all seen. The DS even provides if, say, your battery goes dead. It's one of the few cars of its era to still come with a starting crank. So, if you have a dead battery and there's no one around to give you a jump, why wait for some stupid tow truck when you can just crank-start your engine yourself? There's been many times I've wished for this in my cars. Have a fender-bender? All the body panels are unstressed skins and can be replaced with just a few bolts. Sure, getting parts is becoming harder, and was never that easy in the US, but a minor accident doesn't have to be the painful, expensive affair that it would be with most classics. This is absolutely a usable classic, and one that doesn't even demand that many compromises from the owner. And this family is perfect proof of just that. No question here. There's two fluids pumping all through this DS: green hydraulic fluid and thick, creamy Characterol, the liquid form of raw character. This car still looks like nothing else out there, and the wagon version, while maybe not quite as lovely as the sedan, has an extra bit of rugged charm all its own. A DS feels alive in a way that so many other cars don't. When you park and turn it off, the hydraulic system gradually de-pressurizes, so the car slowly sighs and hisses and settles down into a crouch, like a lion settling down for a nap. It really makes the car feel like some sort of mechanical organism, and it's great. When you start it up, the reverse happens, and it picks itself up and gets ready to go. I never got tired of watching it. The one-spoke steering wheel, the brake mushroom, the whole interior layout even in the much less cool later interior still stands out, and there's interesting details everywhere. I maybe should have mentioned this in Usability, but an interesting example of this is right in the speedometer. Inside the dial, there's a rotating disc that shows the stopping distance from your current speed. It's one of those great, simple ideas that makes everyone who gets in the car wonder why the hell don't all cars have that? It's practical and cool and unusual, all at once. You feel great just being anywhere around this car. It makes any trip vastly more interesting, and that's the highest praise you can give a car's character. Citroën DSes have always had a loyal following here in the US, though many potential buyers can get scared off by the perceived complexity. And, sure, the car is complex, but as Til told me, it's really no more complex than many other premium cars of the era, and compared to classics that used primarily electronics to achieve their sophistication, the hydraulic system may actually be easier to deal with. Unlike electronics, you can actually physically see and feel what's going wrong in the hydraulic system. In the end, it's all just hoses and valves, and if one's broken or leaking you can find it, and that can be much easier than running down gremlins with a multimeter. Take care of the system and it's surprisingly robust. This American-market-spec DS with its less-desirable lights is a bit less valuable than a Euro-spec one, but one like this in decent shape could actually be a decent bargain, comparatively. Prices vary wildly based on condition, but it's still possible to find decent, running project ones well under $10K, albeit pretty rarely. Restored examples hit from $15,000-$25,000 depending on condition, rarity, etc. These aren't getting any more common, and I'd expect prices to keep rising as time goes on. They're not for everyone, but they're definitely collectible. This is an amazing car, no matter what. Usable, unique, technically novel, and a joy to drive. No wonder they call these things goddesses. MSRP: Approximately $3500 in the US, in 1972. About $20,000 in today's money.